Many of us knitters like to read. There are tons of knitting pattern and instruction books out there. Books teaching you a specific method or teaching you about tools of the trade. Stitch bibles with exciting stitch patterns to incorporate into your own design. But there are also books that are about knitting and knitters. 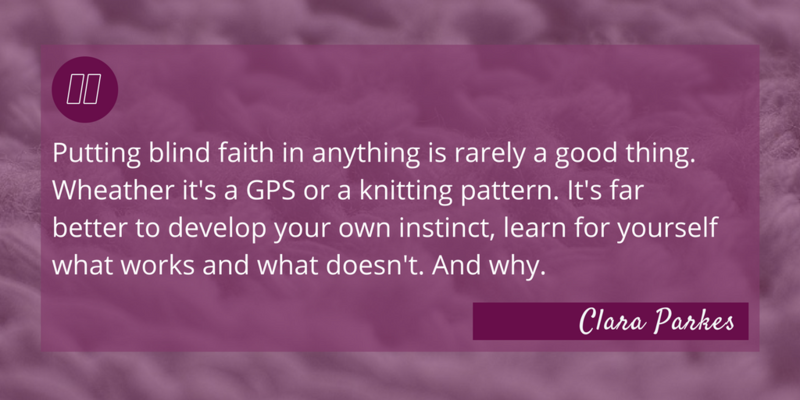 The Yarn Whisperer – My Unexpected Life in Knitting (*) by Clara Parkes is one such book. Before we get into this: I own an audiobook copy, so if my punctuation in quotes I’m using seems off, that is why. Clara Parkes has been a knitter since her childhood. As she states, she’s always been fascinated with yarn and wanted to know how it worked. As with many of us, she was taught the basics by a female relative (her grandmother). Many years later she finally decided to follow her heart and do something more with her passion – and so the Knitter’s Review came to be. Her love of yarn also led to her writing books about it and knitting: Like The Knitter’s Book of Wool (*), The Knitter’s Book of Yarn (*), or The Knitter’s Book of Socks (*). She has another book of essays called Knitlandia – a Knitter Sees the World (*). And for those who want to learn even more from her, there are two Craftsy classes you can watch: Stashbusting: Make the Most of the Yarns You Have (*) and Know Your Yarn: Choose the Perfect Yarn Every Time (*). And for those lucky souls who can attend them (read: not me, unfortunately): she also teaches at some knitting events in the States. She also put together the anthology A Stash of One’s Own (*) (which just so happens to be on my to-buy-list) and will begin work on a new book later this year. 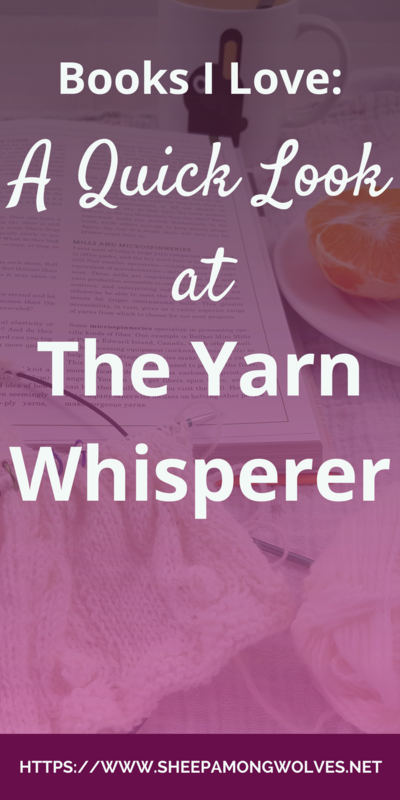 What is The Yarn Whisperer About? 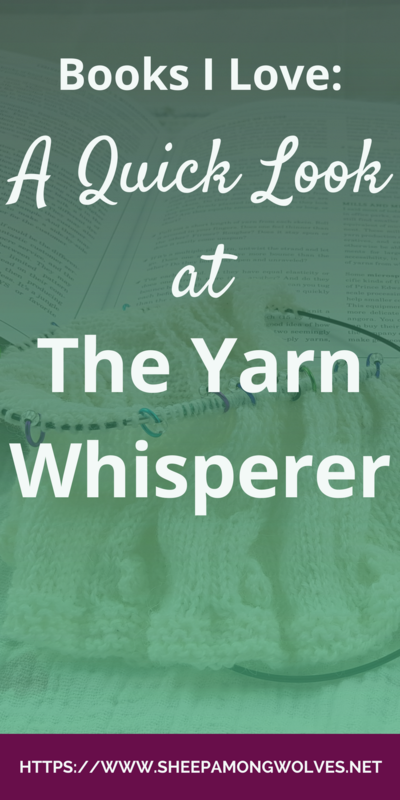 The Yarn Whisperer (*) is a collection of 22 essays. Clara Parkes tells us stories of her life and about the people close to her, of her experiences and musings. She lets us into her life and her mind. And the stories often get personal. And she always connects them to knitting, yarn and the world of a knitter. Here she tells us how she used to work in customer support for Macy’s for a while. How she didn’t know what she was doing and finally just pretended to be confident. Which was exactly what she needed to do her job. I loved that story because it was so very applicable to everyday life. How often do you have to appear confident when you’re not really feeling it? But if you, people will listen and they will take you seriously. I’m a very shy person, but I pretend not to be shy as well as possible because I need to. How else would I be able to make connections, work and be a good parent for the wolflings? Fake it ‘til you make it. And wouldn’t you know, it works. In this story, she tells of us sudden changes in her life and how traumatic they are. Life changes are like a steek. If you don’t prepare for it, don’t secure it, it can be utterly traumatic and entirely unravel you. But she also explains how the cutting is needed for the knitted piece to transform, to become something more than it was, to grow. Cutting a steek to her is like a coming of age for fabric. This was my absolute favorite essay. I found the analogy to be on point, and it resonated deeply with me. Now, this essay is all about gardens. The plant-based kind – and the yarn-based (that would be the stash). I think it’s a beautiful story for everyone who struggles with their stash and keeps it hidden but also to everyone whose stash on display and all tidily organized. It’s a different way of looking at it, and it gave me a new appreciation for it. Yarn doesn’t want to remain hidden; it wants to be seen and used. And, quite unlike gardens, yarn needs us to grow. Clara Parkes says our stashes – like gardens – hold secrets and tell stories of our lives, hold memories and they change with us. We don’t always like the same things – which is why we need to go through our stash regularly. Also, we need to keep looking out for yarn pests. Moths are only one form of them. Another, we may not even think about, some of us have at home: children. She tells of a child and scissors. Less horrific, Tiny Wolf just went through my stash while I wasn’t looking. She grinned at me when I came back in and just said: “Look, Mama, I made a big pile!” She loves the softness of yarn and is fascinated by the colors. I have big hopes for her future as a knitter. Here she tells us that she kept her knitting habit hidden through most of college – until one day a friend walked in idly knitting a sock. It’s a story of finding knitters and other crafters in the seemingly most unlikely places and that if you just dare to knit in public, you may make new fiber friends. 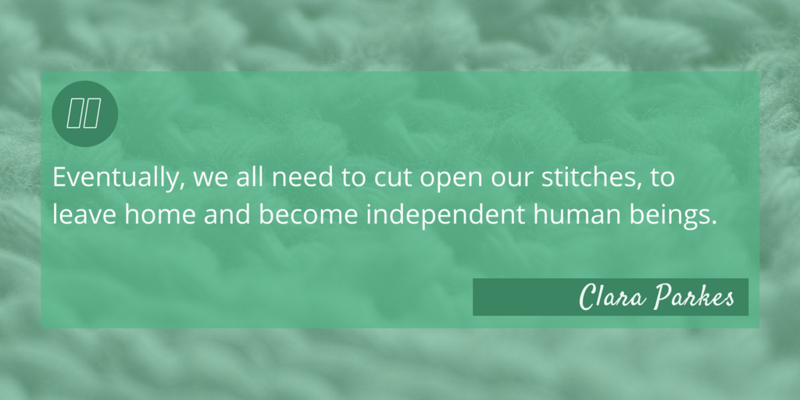 This essay talks all about yarn and stitches, when it seems to be a lot more about people. Stitches need friends as we do. If they lose connection, you find out about the yarn’s true character. Yarn that is silky smooth often forms stitches that when dropped run for the nearest exit (the cast on edge). But the rustic, seemingly unspectacular and often unpopular type of yarn make a fabric that will catch the fallen stitch. They are loving and warm and loyal to a fault. I thought this was a lovely way of looking at people through a fiber enthusiasts eyes and held much truth, though it may be a bit generalized. This is my second favorite essay. I just thought it was very profound. 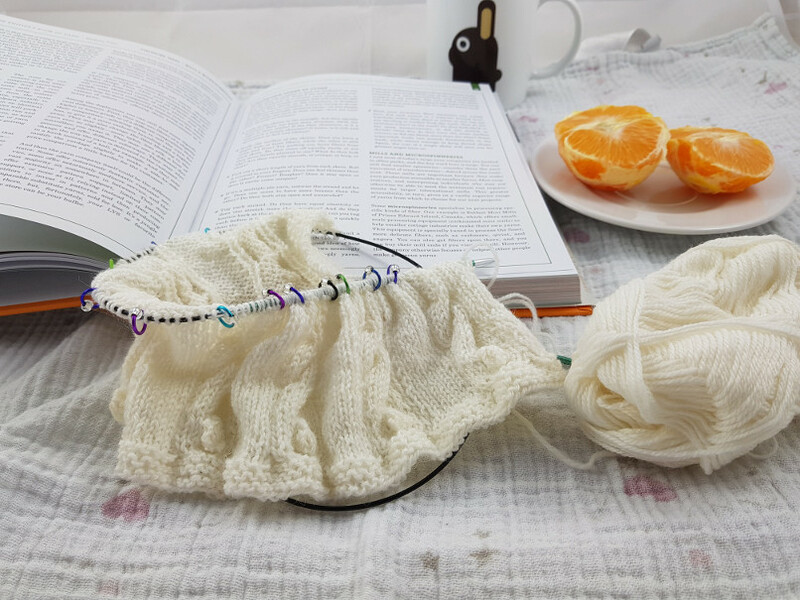 Here Clara Parkes tells us that knitting is “the ultimate sequential process” (I loved that expression), one step always builds on the next, and they can’t be done out of order (unless you are knitting cables). 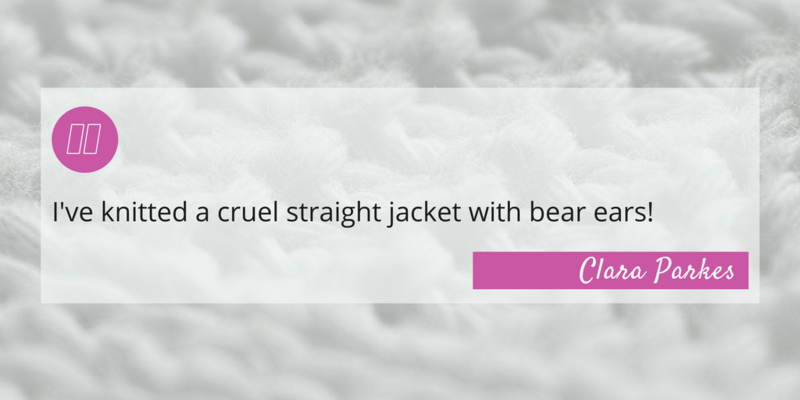 But unlike many other things, it can be undone without permanent damage to the yarn. We call unraveling frogging because it sounds more positive. Unraveling has a negative connotation because it is also used for people who are falling apart and we see that as a negative thing. But we shouldn’t forget that unraveling can also mean to loosen, to disentangle or to solve. I found this to be a powerful and positive message about mental health and the stigmata concerning it. I only gave you a little glimpse of what you can expect from this book, what it is about. To get the full experience, you will have to read it yourself. I would even say: get the audiobook version. I have it, and Clara Parkes narrates it herself which makes her essays so much more emotional and meaningful. Only she can read her own words the way she meant them after all. Her essays are thought-provoking and inspiring. And she tells us so much of her life and her thoughts that you feel you know her a lot better after reading it. It’s comparable to Stephanie Pearl-McPhee’s books (*), though not quite as funny. But let’s face it, very few people are as funny and capable of the same dry humor as she is. But where it lacks humor it adds another layer of emotion and insight. Clara Parkes merely has a different style of writing. I only have one critique: Sometimes the knitting analogy seemed a bit fabricated, or the segueway felt a bit strained. As if she sometimes just couldn’t find a smooth path to it. It didn’t bother me that much, however, and is only my personal opinion. This book is for you if you like books about knitters and knitting and how knitters look at the world. As I said before: Overall I loved the book, and it gets a definite recommendation to knitters of all skill levels and walks of life from me. This book is not for you if you don’t like books of essays, don’t like reading about knitters and their view on the world or really wanted some hands-on advice. There is some good advice for knitters in there actually. But it’s not a knitting help book; it isn’t meant to be, what you are meant to find and get from it. Have you read this book before? Or have you read any of Clara Parkes’ other books? Which book or essay is your favorite? Please let me know in the comments below. Thanks to the question of one of my readers, next week you’ll get some tips from me about yarn tension in stranded colorwork knitting. So come back next week for more, and if you ever have a question or an idea for a blog post, please drop me a line. I strive to answer every comment and every email. I apologize for the late response. The server had a hiccup which I didn’t notice until I tested something completely different and then realized that it had also kept some unapproved comments from me. There are links throughout this post. Your safest bet is Amazon (*) but your local book store should also be able to get it for you if you provide them with the name of the author, the title and if possible the ISBN (ISBN-10: 1617690023, ISBN-13: 978-1617690020).